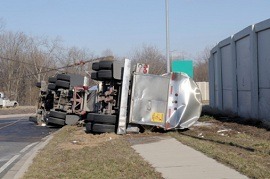 Residents of Illinois who have been hurt in a truck accident often have legal rights to assert. These crashes may have catastrophic consequences, such as spinal cord damage, brain trauma, broken bones, and other injuries. Careless behavior by a truck driver or their employer often lies at the root of a truck accident. The legal issues involved may be complicated, and multiple parties often may be liable. A careful investigation by a personal injury attorney may be critical in bringing a strong claim. At Kurasch & Klein, our experienced Chicago truck accident lawyers can help you seek the compensation that you need for your injuries. We understand the stress that you are going through, and we will aggressively pursue all of the parties responsible in settlement negotiations or at trial if needed. According to the Illinois Department of Transportation, truck accidents lead to a disproportionate rate of serious injuries. In 2014, for example, nearly 20 percent of these crashes caused incapacitating injuries. This is not surprising because trucks may weigh several times as much as the cars surrounding them on the roads. Smaller vehicles easily may be crushed by the momentum of a truck in a jackknife or override accident, for example. The commercial trucking industry is heavily regulated at the federal and state levels. These rules are put in place to minimize the risk of collisions. Some examples include limits on the number of hours that a truck driver may drive in a day and week, testing procedures for drugs and alcohol, and rules for keeping maintenance records. Unfortunately, these regulations are often ignored, and devastating accidents may take place as a result. If a negligent truck driver has harmed you, you likely will be able to bring a claim against the driver. In Illinois, a plaintiff in a truck accident case will try to prove that the defendant driver acted carelessly and unreasonably under the circumstances. The plaintiff also will seek to show how the trucker’s carelessness led to the collision. This essentially means that the victim would not have been hurt if the defendant had acted with the proper care. Plaintiffs who prevail in these cases may be able to receive many forms of damages, such as medical bills, lost income and earning capacity, pain and suffering, vehicle repairs, and future treatment costs. In some cases, you may be able to hold a negligent truck driver’s employer accountable as well through a concept known as vicarious liability. This may be possible if the truck driver was on the job at the time of the accident. Bringing a trucking company into the case may be useful because it generally will have more assets and insurance coverage than an individual driver. A crash involving a tractor-trailer or a big rig may have serious and long-term consequences for everyone involved. If you or someone close to you is dealing with this situation, it is important to seek the guidance of a capable Chicago truck accident attorney who can assess the merits of your case. Both Attorney Kurasch and Attorney Klein are AV-rated attorneys who have been repeatedly recognized as Illinois Super Lawyers. Kurasch & Klein represents victims and their families in Naperville, Wheaton, Schaumburg, and other communities in Cook County. To set up a free consultation with a motor vehicle collision attorney, call us at 312-372-7250 or contact us online.